Luke 10:1-3. After these things the Lord appointed seventy others, and sent them two by two before His face, unto every city and place where He was about to enter. And He said unto them, "The harvest indeed is great, but the laborers few. Pray therefore the Lord of the harvest to send forth laborers into the harvest." The Holy Spirit by the mouth of the holy prophets commanded the ministers of the saving word of the gospel, saying, "Sound the trumpet on the new moon, on the solemn day of your feast." And to the new moon we may compare the time of our Savior's coming. For a new world arose for us, in which all things have become new, as the very wise Paul assures us in his writings. For he says, "The former things have passed away, behold, all things have become new." By the new moon therefore, and solemn feast, we understand the time of the incarnation of the Only-begotten, when a trumpet sounded loudly and clearly, even that which proclaimed the saving message of the gospel. For is not that a time which invites us to keep festival, when we were justified by faith, and washed from the pollutions of sin, and death abolished, which had tyrannized over us, and Satan ejected from his mastery over us all; and in which by sanctification and justification we have been united to our common Savior Christ, and enriched with the hope of unending life and glory. These are the loud trumpet's sounds, and they run not only through Judea, like that law which was of old, but throughout the whole earth. And this is pictured for you in the writings of Moses. For the God of all came down in the likeness of fire on Mount Sinai, and there was a cloud, and darkness, and gloom, and the voice of the trumpet with a loud ringing sound, according to the Scripture. But the notes of the trumpet were, it says, few at first, but afterwards they waxed longer, and became louder and louder continually. What then was it which the shadow of the law signified to us by these things? Was it not this: that at first there were but few to proclaim the Gospel tidings; but afterwards they became many? And Christ began the work, and having first chosen the twelve apostles, He afterwards appointed, it says, seventy others. And that, not as though those who had been already called to the honor of the apostleship had been guilty of any neglect, or been led into anything unbecoming, but because a great multitude was about to believe in Him. For not Israel only was caught in the net, but also the crowds of the Gentiles. For that the message of salvation would take possession of the whole world, the God of all declared by one of the holy prophets, saying of it, "Judgment springs up like couch-grass in the furrows of the field." For like as the couch-grass springs up in the furrows that are left without cultivation, and takes possession of them, and spreads everywhere, constantly advancing onwards, so in an exactly similar manner has judgment, that is to say, the grace that justifies the world as declared in the saving tidings of the Gospel, taken possession of every city and place. Besides these twelve therefore, there were also seventy others appointed by Christ. And again a type of this was prefigured in the words of Moses. For at God's command he also chose seventy, and God sent the Spirit upon those who had been chosen. And yet again, we find the twelve disciples, and these seventy also, indicated to us by the shadow of the law. For it is thus written in the Exodus concerning the children of Israel: "And they came to Marah and the people could not drink the waters of Marah; for they were bitter. And Moses cried unto the Lord, and the Lord showed him a tree; and he cast it into the waters, and the waters were made sweet." Now Marah, when translated, means bitterness; and is taken by us as a type of the law. For the law was bitter, in that it punished with death. And of this Paul is witness, saying, "He that has despised Moses' law is put to death without mercy at the mouth of two or three witnesses." It was bitter therefore, and unendurable to those of old time, and was unacceptable on this account, just as were also those bitter waters. But it also was sweetened by the honorable cross, of which that tree there shown by God to the blessed Moses was a type. For now that the shadow has changed to the spiritual contemplation, we behold with the eyes of the nous the mystery of Christ, that lay hid in the types of the law. Although therefore the law was bitter, it has now ceased to be so any longer. "And after Marah, they came to Elim." And Elim again when translated means an ascent or increase. And what again was there at Elim? "Twelve wells of water and seventy palm trees." 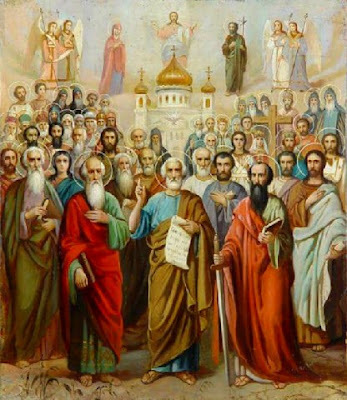 For as we ascend to more perfect comprehension, and hasten onward to spiritual increase, we find twelve wells, that is, the holy Apostles, and seventy palm trees, those, namely, who were appointed by Christ. And very excellently the disciples are compared to wells, and the seventy, who were subsequently chosen, to palm trees. For as from holy wells we draw from the disciples of our Savior the knowledge of all good, while we praise the seventy also, and, so to speak, call them palms; for this tree is strong-hearted, and firm of root, and very fruitful, and constantly grows besides the waters. And such we affirm the saints to be, for their nous is pure, and steadfast, and fruitful, and habitually delights itself in the noetic waters. Therefore, to return again to what we were at first saying, the Lord "appointed another seventy." But some may perchance imagine that the former had been dismissed, and deprived of the honors of the apostleship; and that these were promoted in their stead, as being better able to teach than they were. To remove therefore such thoughts from our minds, He Who knows hearts, and is acquainted with things to come, even as it were apologized, saying, "The harvest indeed is great; but the laborers are few. Pray therefore the Lord of the harvest to send forth laborers into His harvest." For just as lands covered thick with produce, and broad and long, require numerous and able laborers; so the whole earth, or rather the company of those about to believe in Christ, being great and innumerable, required not a few teachers, but as many as would suffice for the work. And for this reason Christ appointed those who were to be the allies, so to speak, and assistants of the twelve disciples. They went therefore on their mission, being sent two by two to every city and village, crying, as it were, in the words of John, "Prepare the way of the Lord." But observe this: that while He said, "Pray therefore the Lord of the harvest to send forth laborers into His harvest," He did it Himself. And yet Who besides is Lord of the harvest, that is, of the dwellers on earth, but He Who by nature and truly is God. "For to Him belongs the whole earth and its fullness," as Scripture says, and He is the Creator of all, and its Fashioner. But inasmuch as it belongs to the supreme God alone to send forth laborers, how was it that Christ appointed them? Is He not therefore the Lord of the harvest, and God the Father, by Him and with Him, the Lord of all? All things therefore are His, and there is nothing of all things which are named that belongs to the Father, which is not also the Son's. For He also said to the Father, "Those whom You gave Me out of the world, they were Yours, and You gave them unto Me." For, as I said, all those things that belong to the Father are declared to be, and are, the property of the Son, and He is radiant with His Father's dignities. And the glory of the Godhead belongs to Him, not as a thing conferred and given Him by another; but rather He subsists in honors which are His by nature, as He also does Who begat Him. And the wise John also affirms that we all are His, thus saying of Him: "I indeed baptize you in water, but after me comes He Who is mightier than I. He shall baptize you in the Holy Spirit, and in fire. Whose fan is in His hand, and He will cleanse His floor, and will gather the wheat into His garner, but the chaff He will burn with unquenchable fire." May it be our lot then as rational wheat, to be carried into God's treasure house, oven into the mansions that are above, that there, in company with the rest of the saints, we may enjoy the blessings which God bestows in Christ, by Whom, and with Whom, to God the Father be praise and dominion with the Holy Spirit, for ever and ever. Amen.